Χάρη στην ποιοτική διαμονή και την άριστη εξυπηρέτηση του Le Jardin Hotel, στην επίσκεψή σας σε Pakse θα νιώσετε σαν στο σπίτι σας. Το συναρπαστικό κέντρο της πόλης είναι μόνο 2km μακριά. Από τη βολική της τοποθεσία, η ιδιοκτησία προσφέρει εύκολη πρόσβαση σε κορυφαίους προορισμούς της πόλης. Το Le Jardin Hotel προσφέρει επίσης πολλές εγκαταστάσεις για να εμπλουτίσετε την διαμονή σας στη Pakse. Για να ονομάσουμε μόνο λίγες από τις εγκαταστάσεις του ξενοδοχείου, υπάρχουν τα δωρεάν WiFi σε όλα τα δωμάτια, ημερήσιος καθαρισμός, κατάστημα δώρων/σουβενίρ, παράδοση ειδών παντοπωλείου, ιδιωτικό τσεκ ιν/τσεκ άουτ. Η ατμόσφαιρα του Le Jardin Hotel αντανακλάται σε κάθε δωμάτιο. Στην ιδιοκτησία θα βρείτε επίπεδη τηλεόραση, καθρέφτης, σύνδεση internet (ασύρματη), δωμάτια για μη καπνίζοντες, κλιματισμός, καθώς και πολλά άλλα. ΟΙ ψυχαγωγικές δραστηριότητες του ξενοδοχείου, οι οποίες περιλαμβάνουν τις εξωτερική πισίνα, σπα, κήπος, είναι σχεδιασμένες για να χαλαρώνετε και να ξεφεύγετε. Όταν ψάχνετε για ένα άνετο και βολικό μέρος για να μείνετε στη Pakse,το Le Jardin Hotel γίνεται το σπίτι σας μακριά από το σπίτι σας. Apart from the star rated reasons, owner Noi was exceptionally hospitable by taking us (and showing us how) to do the morning alms at Wat Luang so early in the morning, plus allowed us to use the kitchen to prepare alms to offer to the monks. The daily free shuttle for guests into and back from the city for dinner was also incredibly helpful. I really enjoyed my 5 day stay at Le Jardin. It is a small hotel with a charming character, and the staff were extraordinarily attentive. It is a short tuk tuk drive from the central area, but that is a minor inconvenience. And the swimming pool is just what is needed after a hot day. Cozy, quiet, and "colonial" feel. Wonderful and extremely helpful staff. They got up at 0430 to make breakfast specially for us, before we got picked up by bus company. Arranged tour and bus ticket for us. Room is very comfortable, right near a small inviting pool. Great atmosphere. Arrange ride into inner town for dinner and walk around each night. Would be our place for return trips. Love Pakse. Wonderful hotel run by wonderful people. a little out of town, but its nice and quiet at night and they run a shuttle bus into town and back in the evening. breakfast is really good, especially the omelettes. booked for 1 day and stayed for 3. 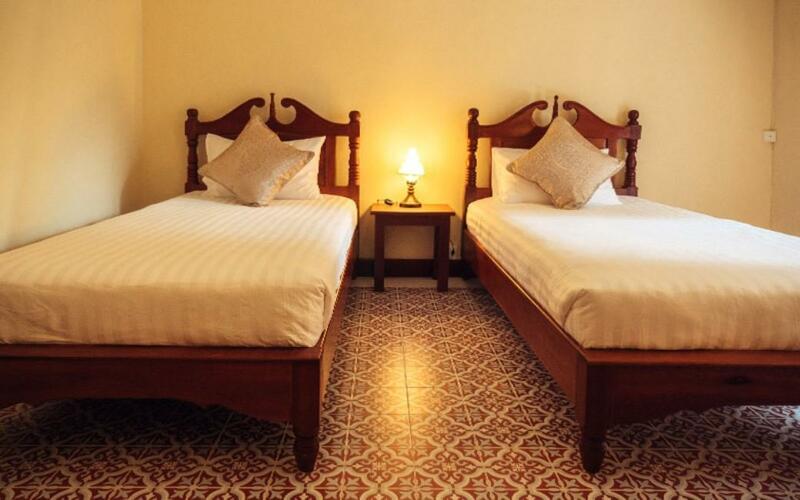 Beautifully renovated old buildings with very attractive and comfortable rooms. The breakfast was delicious and the guest relations staff were the best I've met anywhere. They took the time to inquire personally each day if we needed assistance and suggested some fantastic dining options in town. Beautiful pool too. Would happily return. The staff couldn’t do enough for us. We were so impressed with this hotel. It was a quiet, peaceful spot in the chaos that is Laos. The pool was clean...as was everything else. Easy walk to the Friendship Mall. We stayed at Le Jardin Hotel in Pakse twice as a stop over on our trip to the 4000 islands. The hotel is incredibly well run by Ms Noi who will greet you by name and together with her staff will make sure you enjoy every moment of your stay. The hotel provides a nice breakfast (eggs made to order, fruit, yogurt, juice, coffee, tea, baguette, jams), has a good sized pool to cool off, airconditioned rooms and comfortable beds. The details in this hotel are nicer than in any other hotel we‘ve encountered on our trip, everything is thoughtfully designed and executed. Since the hotel is outside of the core of Pakse they provide a free nightly shuttle into town for dinner and will recommend good places to eat. All around a lovely place to spend some time. ...nice view from terrace to old French Bridge and short walking distance to our favourite “Our kitchen” for meals all day. This resort has a new pool, which comes in handy if you feel like a swim at the end of the day...locals told us not to swim in Mekong downstream from Don Khong due to parasitic infestation causing liver damage/cancer...not sure if true but we stuck with pool! What a lovely little hotel, staff are extremely helpful, rooms are neat and clean, breakfast limited but fresh and tasty. Free tea and coffee all day. Pool and poolside area great. Only downside is the location, a bit to far to walk to the centre, which is mot a problem during the day as you can get a tuk tuk, but once it gets dark, its pretty hard to find a tuk tuk in Pakse, however full marks to the hotel, give them a call and they'll come and pick you up. Finally big thank you to the manageress, she was very welcoming and very helpful. Very new and very nice style of hotel set in gardens with a nice pool. The owner Khun Noi was ever so helpful, and chatty about what we could do around Pakse. 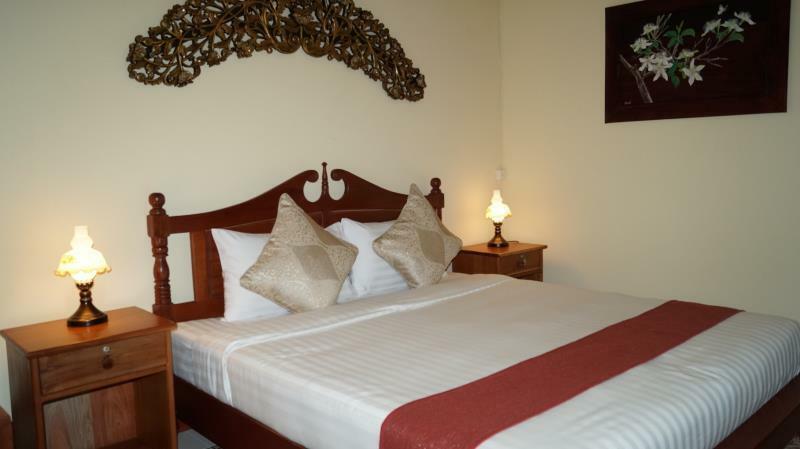 The rooms are large and comfortable and a large bathroom. The rooms give out on a long balcony with chairs where you can relax. Breakfast was good and staff attentive. I would highly recommend Le Jardin as a perfect place to explore the 4000 islands and Bolaven plateau as well as pakse. We went there in July 2018. The hotel is very nice, a bit outside of the centre, but close to the biggest market of the town and also to a shopping mall. Rooms are very clean but above all the rest, the staff is just incredible: they always made their very best to get us comfortable and enjoying our stay. I can only warmly recommend this place if you cross Pakse. Location is ok. Many restaurants are within walking distance. Room is clean and comfortable. Hotel is a little oasis after long day out. Hotel staff was very friendly and helpful. Recommended. I enjoyed my stay at Le Jardin very much. super place for one or more nights. The owner and the staff were very nice and I immediately felt very welcome. Very personal and individualized attention to the guests in a home-like charming environment. We stayed twice on our way to and from the 4000 islands and were very pleased with the experience. This is a clean and attractive hotel with an excellent pool and recliners for relaxation. Staff are friendly and helpful. The courtesy minivan into Pakse is useful for evening meal outings though a songtheau into town is quite easy and inexpensive also. The breakfast is simple but adequate.